Stately properties, grand estates. And some of the most beautiful terroirs in the Napa Valley. French winemaking traditions that bring California fruit alive on a stunning vineyard. A one-of- a- kind winery with 150-year- old roots and charming contemporary art. And an elegant chateau full of history, restored to its former glory. Each an important part of Napa Valley history and a special place on your journey. 3-hour rail tour of Napa Valley, departing at 10:45 a.m.
Quattro Vino Tours are an indulgence start to finish. Elegant interiors. Plush mohair. Gleaming brass. Sleek fixtures. The train car, rattling at an easy pace through extraordinary Napa countryside. Sweeping rows of vines, some there since 1868, whisper stories. By now you’ll have more than a few stories of your own to tell. By the time you come to the end of the line, you don’t want your journey to end.But in a way it doesn’t. Because it’s a trip you’ll never forget. Sparkling wine is the best kind of welcome. And a light gourmet breakfast trio of ciabatta and smoked salmon, Greek yogurt smoothie, and steel cut oatmeal brûlée gets your palate ready for the adventure ahead. Your traveling companions, an intimate group of 30, are ready to share in the discovery, the best of which might be the unexpected connections you make on your way. First stop, the revered Domaine Chandon, a pioneer of California sparkling wine, founded in 1973 by Champagne house Moët & Chandon. The investment turned more than a few heads, and the exquisite architecture, lush landscape, and one of the most beautiful locations in Napa Valley are sure to turn yours. Go behind the scenes in the world of sparkling wines and the grapes used to make them. 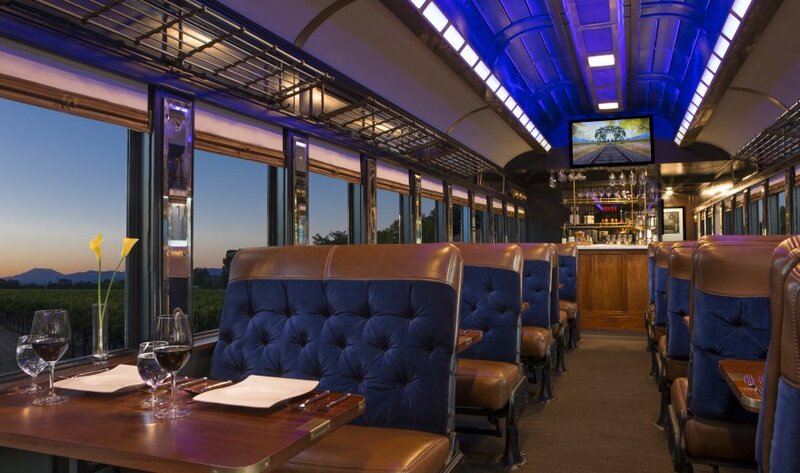 The setting on the Napa Valley Wine Train is luxurious and elegant. And your second course is equally as decadent: asparagus bisque with white truffle oil and aged parmesan alongside mixed greens with mission figs, spiced walnuts, and point reyes blue cheese. A 150-year- old historic vineyard. An inspiring collection of more than 35 works by internationally acclaimed artists. And world-class, award-winning wines. The striking 35-foot- tall rabbit sculpture, Bunny Foo Foo, hints that you’ve arrived somewhere special. Everything else at Hall confirms it. A stately meal is waiting for you back on board, with your choice of grilled local duck sausage with buttered leek-potato ragout or pan roasted ling cod in plum tomato-fennel broth. Lavish ambience is always served. Last stop, Inglenook. A stately chateau and vineyard born from the passions of a Finnish sea captain, wine connoisseur, and entrepreneur, restored to its heritage by director Francis Ford Coppola and his wife Eleanor. The estate has many charms. A terrace reminiscent of an Italian piazza. Intriguing infinity caves. And of course, the historic Gustave Niebaum Cabernet Sauvignon selection, first planted on the property in the 1880s. The train rolls down the track, taking you back, while you indulge in the fourth course—our pastry chef’s daily (and very delicious) creation.